Charming fully-furnished stone house with 2 bedrooms and superb terrace with panoramic views ! Village house with 72 m² of living space, cellars and in the heart of the historic centre. Village house to refresh with 87 m² of living space in the heart of the village. The town of Murviel-lès-Béziers is situated in the Hérault department of the Languedoc-Roussillon, close to the coast. It is a lovely and fascinating place, full of character, having originally been built in a circle to protect it from attack. Narrow streets wind their way around the curves created by the circular shape, and the pretty houses with their distinctive porches are bright in the Mediterranean sunshine. Surrounded by stunning countryside, its location in the Hérault is also a bonus as this department is blessed with some of the best and sunniest weather in the south of France, suffering less from the strong winds such as the Mistral that plague many other Mediterranean areas. The name given to such towns as Murviel-lès-Béziers, which have been built in a circular shape in order to withstand attack, is a 'circulade' town. The Languedoc region was targeted by the Catholic crusaders and the rest of France and consequently boasts many such fascinating circulade and bastide towns. The name 'Murviel' comes from the Latin, 'muri' meaning 'walls', and 'vetuli' meaning, literally, 'old man'. The two words combined to mean 'old walls', hence the name of the town. The Romans built a castle here, and the defensive strength of the town gave it a certain importance which belied its relatively small size. Murviel-lès-Béziers may be rooted in centuries of history, but there are plenty of modern conveniences and pleasures here too. Shopping is excellent, and includes a supermarket for your everyday requirements, and as the town is well and truly on the Gourmet Route in the south of France, it is also a fantastic place to dine out. Try, for example, the fine wine and food at the Château Saint Martin… you won't be disappointed! 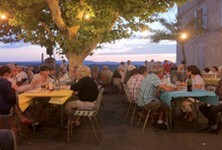 The Languedoc has so much to offer that your only problem will be deciding where to start. You could visit the historic towns of Béziers or the beautiful Carcassonne, or even make a day trip to Barcelona, as the Spanish border isn't too far away. If the countryside is more your thing you can choose the gentle and beautiful vineyards and cornfields around the town itself, or head for the coast to enjoy the warm blue waters of the Mediterranean. Sports aficionados will find plenty to occupy them too, as the area is superb for all manner of water sports, on lakes, rivers and the sea. Other sports available in the area include golf, walking, and cycling. Getting to Murviel-lès-Béziers couldn't be easier or cheaper, as budget airline Ryanair operates flights into Béziers, Carcassonne, Perpignan and Montpellier airports from destinations around the UK and Ireland. The TGV fast train runs a service into Montpellier, so you can travel by rail if you prefer, and for those who enjoy the long and lovely drive through France, the town is accessed from the RD19, off the A9 motorway. 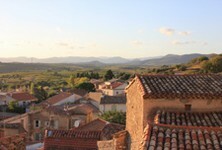 Property in the town is similar in price to many other towns in the Hérault, and like them it does tend to be on the expensive side. This is largely because the area is both highly desirable, being situated close to the Mediterranean Sea, and also because it is so easily accessed from the UK. The upside, however, is that houses in Murviel-lès-Béziers are likely to command a good rental income, should you decide to let the property for part of the year. Types of houses vary, but within the town itself you will find a predominance of larger detached properties, rather than the studios and apartments popular in many of the coastal towns. We are buying a house in Murviel les Beziers. And will hopefully move into it in the summer 2014. We have two boys aged 14 and 10 years old and are thinking that private school may be the way to go as they speak little French at the moment. Am more worried about the 14 year old as exams will be close. Can anyone recommend any good schools in that area please or advise us on what would be a good way to go? Thanks for contacting us. Our article "French Education System - Schools in France", together with the "your questions" and "your comments" sections, should help you. If you want to go down the private schools route, the website www.fabert.com lists private schools in all areas of France. A list of international schools in France can be found on the website www.france.english-schools.org/. You could also look on ex-pat forums, to find other people in the area who might be able to provide information about the schools near Murviel les Beziers. Hobos in France is very helpful apparently. Should anyone reading this be able to offer any further advice, please do get in touch. Do you know Murviel-lès-Béziers better than we do? Do you have photos of Murviel-lès-Béziers? Murviel-lès-Béziers is found in the south of France, in the south of the Hérault department, close to both the Mediterranean coast and to Hérault's border with Aude. Access: By air: Fly into Carcassonne, Perpignan or Montpellier airports with Ryanair. By rail: Take a TGV to Montpellier. By road: Take the A9 autoroute to the Béziers East turning, then the RD19 towards Saint Chinian. Economy: The economy of the town is much as it always was, with olives, corn and wine being important. Interesting fact: There is an unusual festival in July and August, where life-sized dolls made of rags and corn are hung around the town. Known as Les Petetas, this celebrates the harvests of corn and grapes.